We love to grill burgers in the summer. Now our family usually loves homemade baked fries with our burgers, but during the summer, it’s just too hot to bake fries. Instead of fries, I’ll make the best macaroni salad recipe to go alongside those yummy burgers. 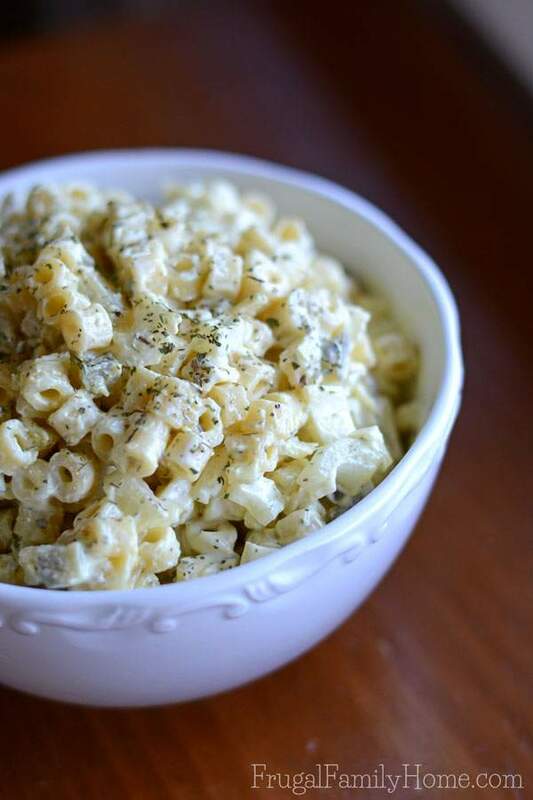 This macaroni salad recipe is the one my grandma, aunt, and mom used to make all the time. I’m a little partial and like potato salad a little better than macaroni salad. But my the rest of my family loves macaroni salad. 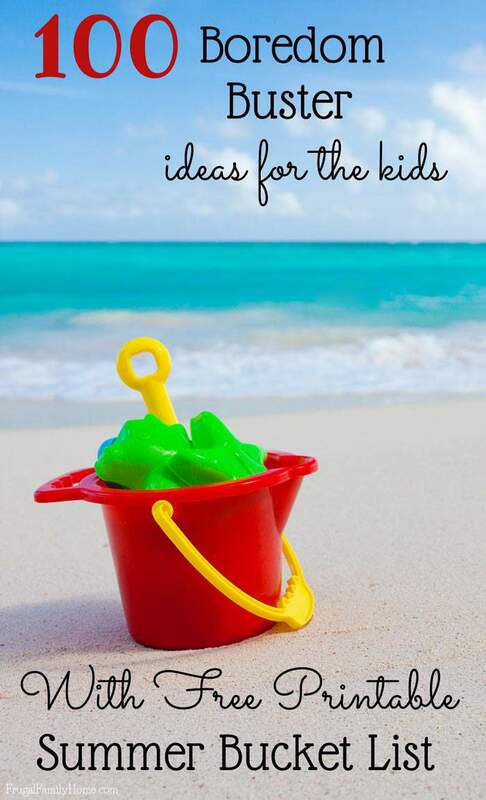 They win out and I end up making this recipe quite often during the summer. This is not only a great side dish for summer barbecues but it’s a great side dish any time of the year. 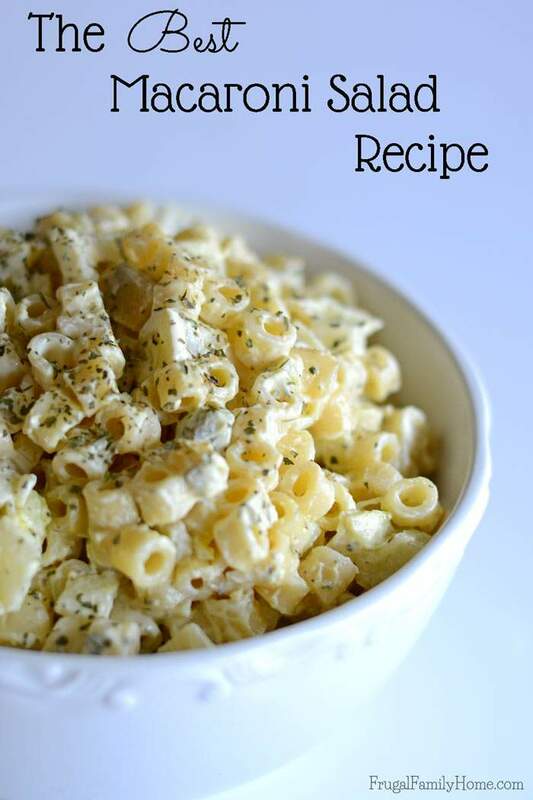 If you’ve never tried homemade macaroni salad, I think you’ll love this recipe. 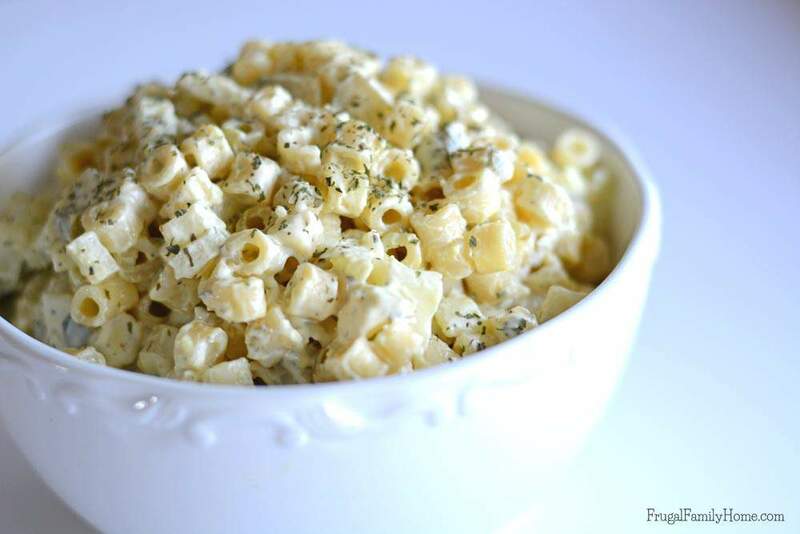 It’s so much better than the store-bought containers of macaroni salad and easy to make too. Just so you know some of the links below are my referral links. Which means when you use them I might make a little money at no extra cost to you. Thanks for your support in this way. You can read my disclosure policy for more information. Boil the pasta. 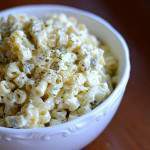 I usually make my macaroni salad with elbow macaroni or salad macaroni. But you can use any small pasta you like. Cook the pasta according to the directions and drain the water. Be sure to drain the water well so the dressing won’t get diluted. I use my colander and it works well. If you have limited space in your kitchen you might want to pick up a collapsible colander. Chop the veggies. 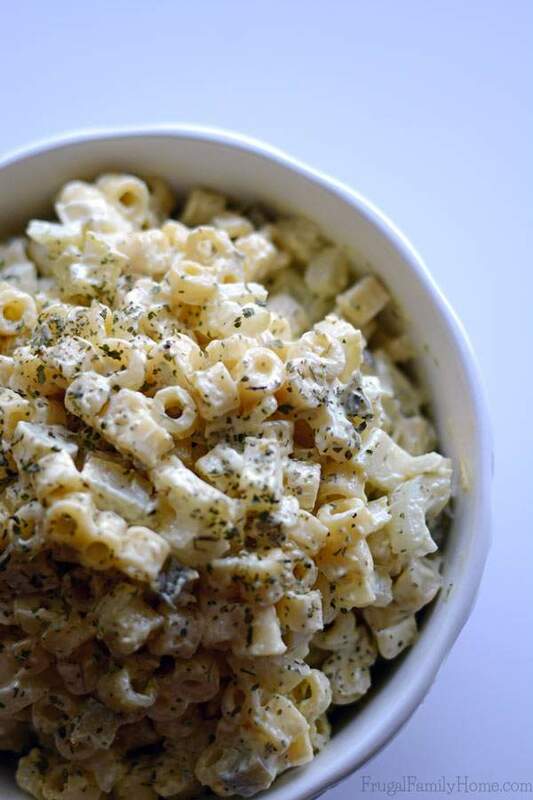 I always include equal parts of dill pickle, onion, and celery to this macaroni salad recipe. But if you have picky eaters who can spot an onion a mile away and won’t eat a dish with them in it. Skip the chopped onions and add in about a teaspoon or two of onion powder. The onion flavor will still be there, just not as strong and no onions for your picky eater to spot. Mix in the chopped vegetables with the cooked pasta. Make the dressing. Mix together mayonnaise, vinegar or dill pickle juice, pepper, salt, parsley, dill weed, dried chives, and mustard in a bowl. Mix the salad dressing with the pasta mixture and mix well to coat the pasta and vegetables. It’s important to really mix the dressing in well to coat the pasta and vegetables. You want to get that yummy dressing all over each bite. Refrigerate until ready to eat. I like ours to sit about 2 hours before we eat it. I keep it in a covered bowl in the refrigerator. The flavors all mix together and the dressing thickens up a bit and gets nice and creamy. Before serving, give a good stir to mix everything well again. Sometimes the dressing can settle a little. Serve as a side dish to almost any barbecued meat or with our favorite burgers and hot dogs. I always keep this salad in the refrigerator until we are ready to serve it. If it’s hot out I don’t let it sit out for long, since it has mayonnaise it needs to be kept cold. A delicious side dish any time of the year. Chop the celery, onion and pickles. Mix with the cooked pasta. In a medium bowl, mix together the mayonnaise, mustard, vinegar or dill pickle juice, salt, pepper, chives, parsley, and dill weed. Mix the dressing with the pasta and vegetables until well combined. What’s your favorite summer side dish recipe? This looks like a tasty salad to serve with something from the grill! Pinning this for later! I’ve made this 3 times already and can’t get enough of it! My husband could finish an entire recipe in 1 sitting. I cut back a little on the mustard and use Just Mayo (it’s vegan). It’s amazing. Thanks for sharing! I just made this with gluten free elbow macaroni noodles. Delish!!! 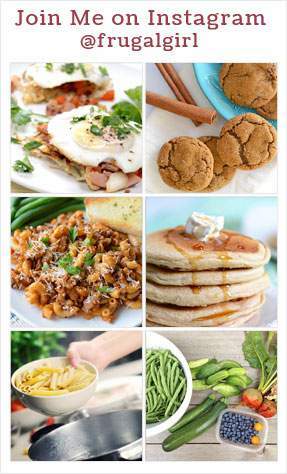 I was looking for a recipe that I could enjoy without sacrificing my gluten free lifestyle. I even made my noodles in the microwave so there was no stove turned on. I can’t wait to serve this alongside turkey burgers!!! My favorite gluten free elbow macaroni is any quinoa blend with brown rice. I find that gluten free noodles made from corn just have too intense of a corn flavor to blend well with a light pasta salad, however, the texture of the corn noodles tend to be more in step with a picky palatte. Joyce, this is not your blog. 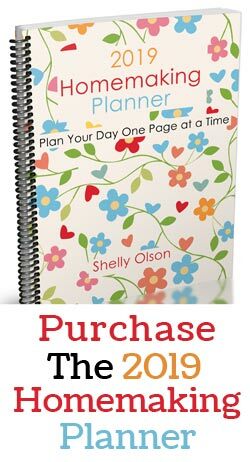 Shelly this sounds perfect as an accomplishment to any summer meal as there is no meat in it and would go good with at BBQ. I’ll try it out on my company when we make ribs this weekend! Thanks! I hope you enjoyed the macaroni salad recipe, Patty. 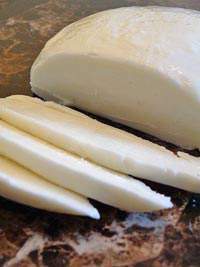 Just want to say thanks so much for sharing this recipe. It is now my go to macaroni salad. Yummy! Many recipes for a pasta “salad”, but this one satisfies everything you want when looking for a true, good ‘ole spunky pasta salad! Our new favorite – thank you!!! I’m so glad you liked the recipe, Mia. Is the one 1 1/2 cups of macaroni dry before it’s cooked? If I use a 16oz box of macaroni do I need to double the other ingredients? Sandy, the macaroni is dry before it’s cooked. I’m not sure how many cups of macaroni are in a 16-ounce box. I think it’s close to 4 and a half cups. I would measure to be sure. This salad is delicious! It tastes just like my old favorite non-vegan macaroni salad, yum! So glad you liked the recipe, Colleen. I just made this for a bbq party and everyone loved it!! My super picky friend even asked me for the recipe and took some home with her! It was so yummy! Thanks for sharing! I’m so glad it was loved by your friend. We love this recipe so much too. Thanks for letting me know. It’s 4-6 servings as a side dish, 4 big portions or 6 smaller ones. I hope that helps.